bandwidth is now available to bring you up to date. There are numerous refinements which we will discuss in a series of posts, starting here with a brief overview of the exterior. The aft antennae collection has evolved as well. There is a hinged central “mast” which carries the main open array radar and the sat com/tv antennae. Maintenance on this gear will be simplified when you can work on it from deck level. The boom design has been solidified and rigging details worked through. The booms now project outboard 9.4 meters/30.4 feet from center, giving enormous roll resistance at anchor. In addition, the booms are long enough to be used for light hoisting over the transom – think someone in the water. Practicalities aside, we like the way the FPB 78 looks now – a lot. Of course we could be biased. A final note on antennae: the wire between radar and forward masts measures over 17m. This is long enough after insertion of insulators at each end to act as a very efficient full wave length 16m SSB antenna. 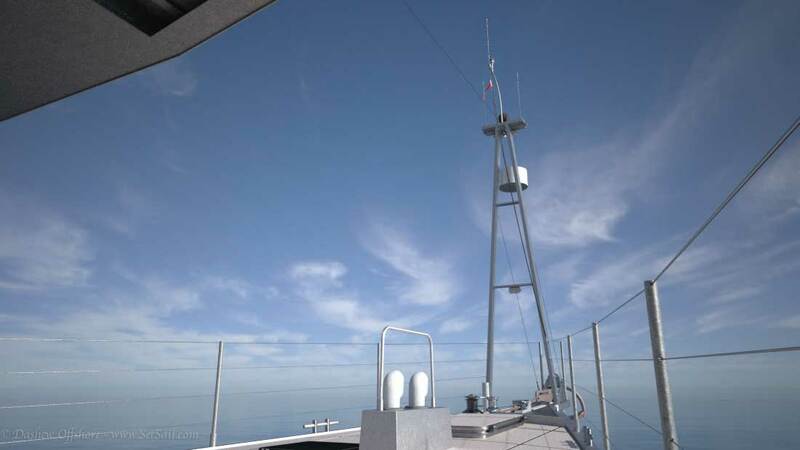 The forward mast carries two VHF and an AIS whip antenna. This reduces the aft clutter and offers better separation between them. This entry was posted on Friday, July 4th, 2014 at 4:16 am and is filed under Dashew Logs, FPB 78. Both comments and pings are currently closed. Thank you for the update; she looks both impressive and wonderful. Without the benefit of your experience, I’m wondering if placing so much (expensive) antennae so far forward, means increased risk of wave damage? Separately, placing the thermal camera so far forward and barely higher than the roof of the matrix deck, seems to make it unusable for looking behind? The top of that forward mast is 7.4m/24 feet off the water. Although this layout is subject to change, solid water should not be an issue, and spray all the way forward will be less than further aft. Regarding sight lines aft for the FLIR you have do not have vision aft as you have surmised. But you can see closer down the sides and under the bow than if the camera was mounted where it can see aft as well. Steve, Reacting to your comment about ease of working on central mast mounted equipment at deck level. 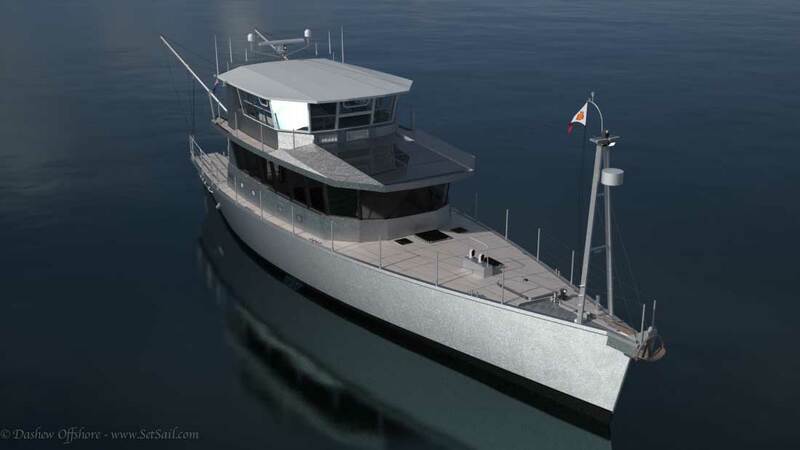 The rendering has the mast hinging, the only possible direction is aft. Aft of the mast are the solar panels. 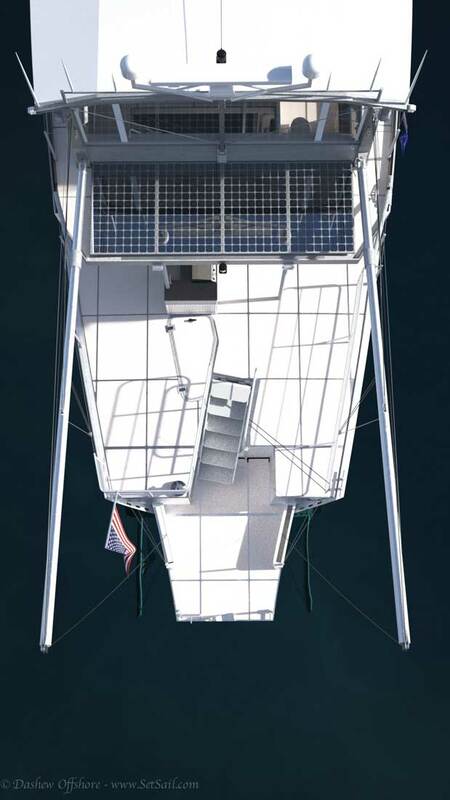 If the mast were to be lowered over the panels, is it your intent that the “stop” would mounted on the aft edge of the “Power deck” (my term)? Doesn’t this add concern for potential panel damage? There is no hard point with a height close to the mast top to rig some sort of belay to control mast decent and there doesn’t seem to be much in the way of workable standing room on this space either. A dropped mast, even from a few inches could take out both panels! OK, we have the mast laid down and we didn’t damage anything, you are now working on overhead equipment turned more than perpendicular to their normal operating position. Please let me know when this is supposed to be easier than straight up. Safer for the tech? Probably! Safer for the gear? Not so sure. 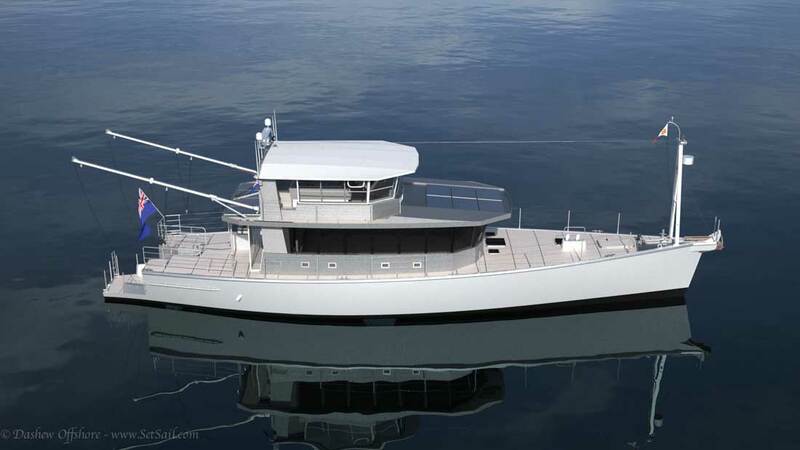 You may wish to consider adding a pad eye to the aft centerline matrix deck overhead and a small cradle stop aft centerline of the power deck. Then you have some rigging options for safely lowering the mast. Overall – looks awesome. Boat account is still growing. Have a great 4th. Good points re the aft mast. 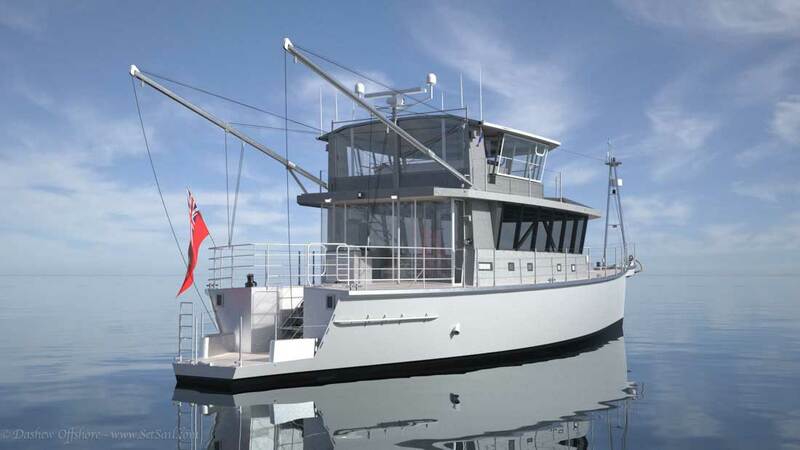 It w ill be lowered with a tackle, which has a good angle load wise. There is provison for temporary side stays to keep the radar/sat com mast in line. And there will be a support chock on the aft edge of the roof to hold the mast in place as well as protect the solar panels. The same will be there for the booms as well. Have you retained the deck hatch access to the aft workshop/crew space? Yes,Steve, access to the work shop via deck hatch and the gull wing door from boarding plaatform. Everything about this design is sheer perfection in my view, except those rear solar panels which are going to be heavily shaded on all but the most ideal of headings. The vast expanse on top of the matrix deck just seems so much better suited to a solar array, whilst to my eye that rear location would be perfect for toy storage like a pair of kayaks or simply a rearward al fresco extension of the matrix deck. 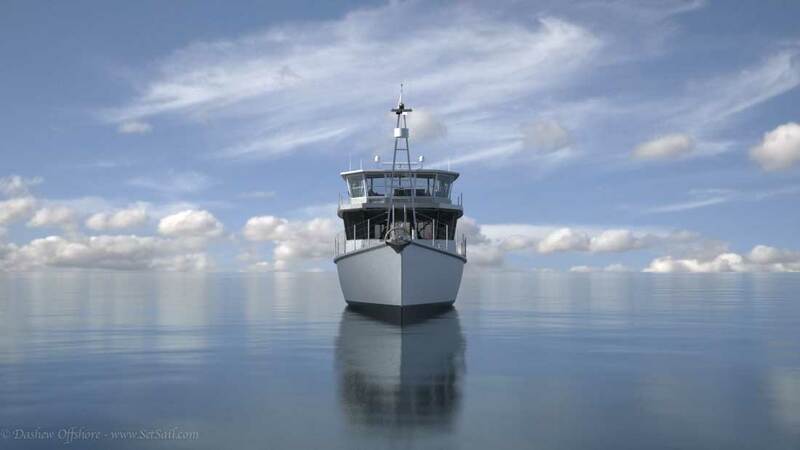 Rob – when at anchor, with the booms out, the aft solars work well for about 50% of the day. Not shown is the fact they are hinged, which will help substantiall if thesun is aft. 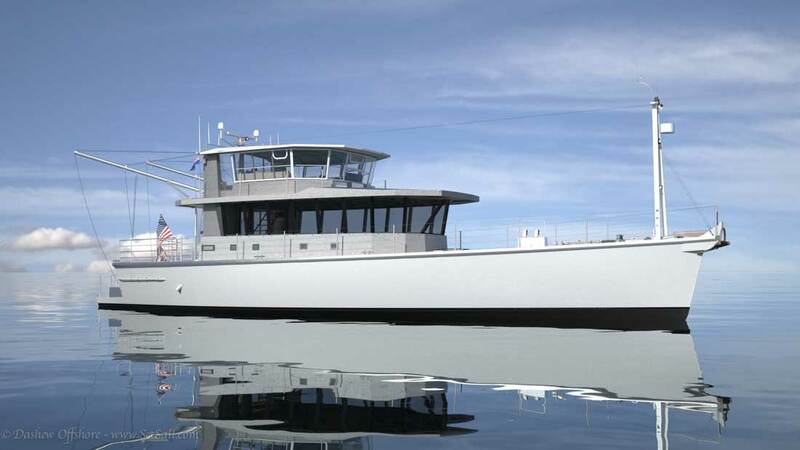 The more efficient these are in terms of the boat’s angle to the sun the less efficient the forward cells, and visa versa. The roof top does not work for us because of maintenance and VCG issues. Note that the cells we are using are not as sensitive to shading as earlier models. Bottom line is that this is a compromise, and in the end we have plenty of solar capacity to get the job done given the battery bank size. If we needed more, we’d consider a rotating/tilting array on a mast all the way aft. Just another wild hare idea. Add drop down seats to the inboard flopper stopper storage wells. I would think having a place to sit to “gear up” prior to leaving the boat would be most beneficial. Especially if there is diver in the crowd. Not wild hare, Jono, practical. Our assumption now is that the tops of these coamings will be used as seats at anchor, in which case flopper stoppers are deployed and not in the way. STEVE, QUESTION ABOUT FOREPEAK LOADING OF HEAVY AND/OR OVERSIZE SUPPLIES. 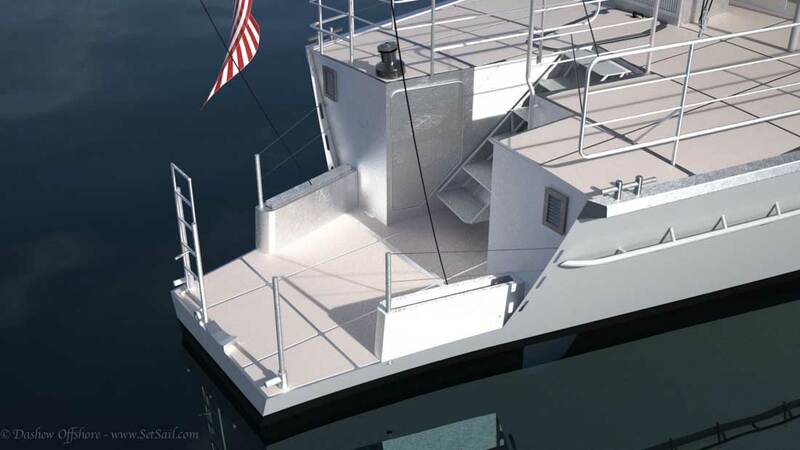 I COULD NOT TELL FROM THE RENDERING IF THER IS A DECK SOCKET FOR THE INSTALLATION OF A TEMPORARY MAST/BOOM RIG THAT YOU STORE BELOW, OR IS THE FORWARD A-FRAME MAST RIGGED TO ACCEPT A BOOM? THE MAST LOOKS TO BE A BIT FAR AND TOO LIGHTLY STAY’D TO BE THE PRIMARY CHOICE. the final touches look wonderful. 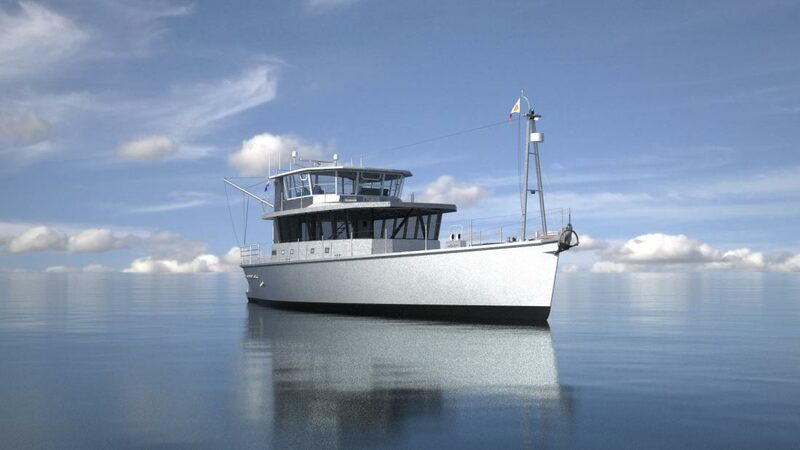 The stern rails on port and starboard look like they are rigid and fixed. I assumed the lift out and rest on the deck when the dingy comes on board, but if that is the case, how will the lines from the booms secured to the rails not lift them…will they be pinned in place? Second, i would think two masts to support the open array would add little to he aft obstructed view and add significantly to the stability while up and functioning and in transition to be lowed aft. The starboard side aft lifeline rails are hinged. We’ll do a post on the details in a month or so. The radar/satcom mast is part of the support framing for the aft roof beam and is clamped at the top. As it is 4″/100mm square and 1/4″/6mm wall, with a short cantilever, we do not anticipate movement issues. Focusing on your boom rigging for a moment, it looks like you’re set up with a fixed vertical angle. Is elevation adjustment built into the rigging? I can’t tell if the boom stay attachment sleeve slides along the boom or is a fixed piece. There are the obvious advantages to being able to center the lifting block over the engine room hatch as well as have it set for launch and recovery operations. As to recovering light loads over the stern due to boom length, great advantage! On a SOLAS type note, it would be beneficial when lifting an exhausted or unconscious person aboard to be able to land them on the aft deck. At the current angle you still have to pull several hundreds pounds of wet sponge onto the swim platform. The swim platform is a bit small to begin any sort of potentially needed life support activities. Angle from vertical is fixed by topping lifts. The dinghy halyard and second outboard halyard (or guy) are adjustable to a degree along the boom. Swim platform is 2M/6.5′ long to the aft side of lockers, with another 80cm to the stairs. Steve, with the forward A-frame mast and a lifting boom in place, would storing a dinghy on the bow of the boat become possible? I can imagine the aft end of the deck being more in use for the social parts of cruising. 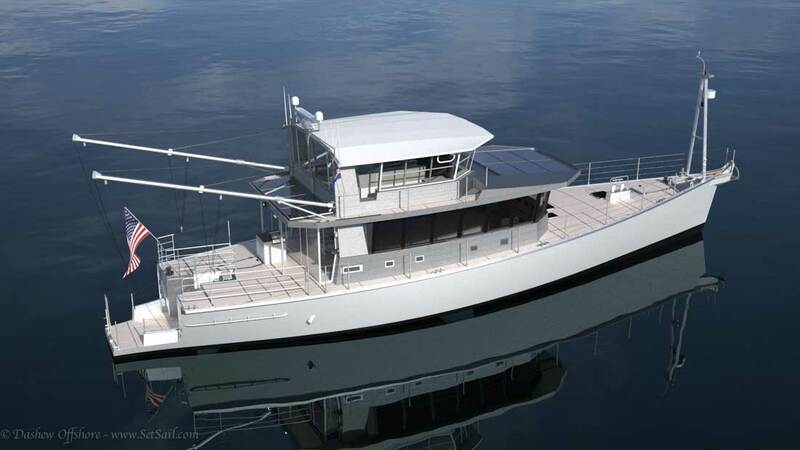 The deck in front of the deckhouse has plenty of room for a dinghy, with the crane in place launching would also be possible. What is your experience with this approach? We prefer not to store anything on the foredeck – ever. This invites disaster when forcing your way upwind in big seas. Given your experience is there any need to heat the forward glass? Most of the high latitude vessels I have been on have had at least a few heated sections. I probably missed it but does your HVAC system include a defroster feature? Our experience is that the best defrosting system is taking the humidity out of the air – and therefor condensation from the windows – using the air conditioning. For example, on Wind Horse if Linda was cooking pasta and steaming the wndows, a minute on one of the air conditioners would clear the windows in the great room.